A family in Franklin, New Jersey is feeling more complete after their furry member who was stolen during a break-in at their home this past Tuesday has thankfully been returned. Barbara August called the police immediately after returning home on Tuesday, to find that she had been victim of a break-in and theft. 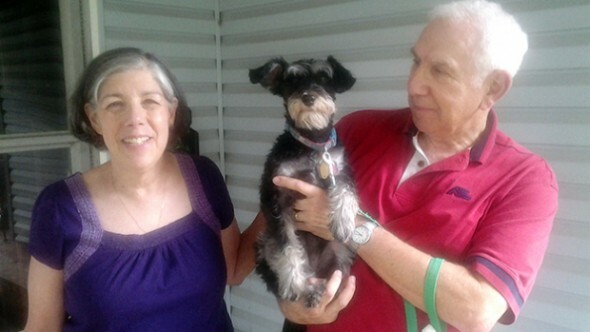 Part of the list of missing things was Pepper, her 1-year-old schnauzer-poodle mix. The dog was described by Barbara as black with white markings over her eyes, chin and paws according to police documents. The next few days would prove to be some of the toughest for August. She was missing her Pepper very much. Investigators worked hard on the case, and now have two suspects in custody regarding the break-in and theft. Along with Pepper, a laptop and tablet computer, jewelry, and even a box of cookies were part of the list of items also missing. The item that was taken that was instrumental in the apprehension of the two suspects was an iPad, that the location settings were in operation on. When they tried to use the device, police were alerted to the area they were in, and eventually found.